Inspired by my week at home in the Cotswolds, this week I am bringing you a series of Country inspired style posts. I have opted for pieces by British brands and designers. 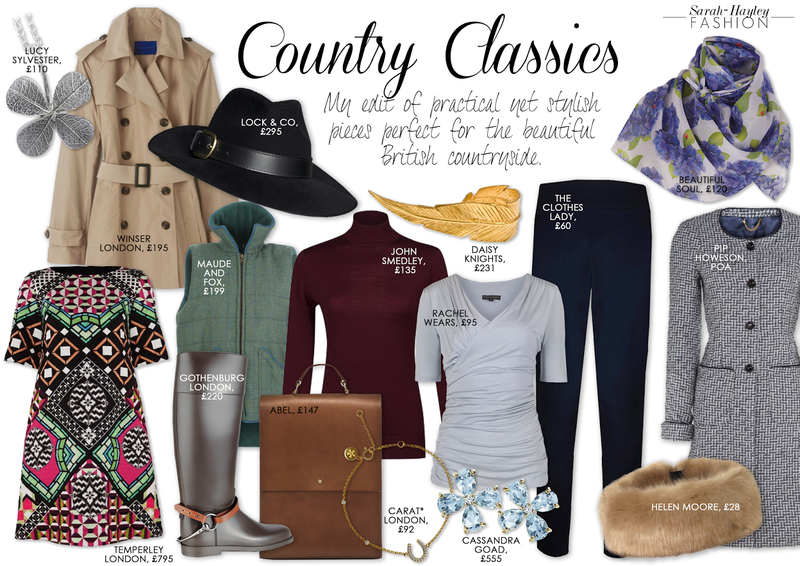 When we naturally think about Countryside attire our minds drift to Ralph Lauren, Hunter, Le Chameau and Hermes. With their equestrian detailing and rustic styling these designer brands have positioned themselves as the go-to labels. Whilst not detracting from the fabulous products by these non-British manufactured brands, it is a time to shine a light on their British competitors. We have many British labels which create luxurious pieces with the same, if not better, quality; however they lack the big budgets to allow the creation of widespread PR campaigns and therefore rely on British journalists and stylists to promote them. One of these brands is Pip Howeson. The coats created by this fresh label are expertly tailored and made from the finest of British fabrics. Last year I styled the 'Florence' coat on a shoot and instantly fell in love with the quality. What I also admire about this brand is the versatility of the design. Team your coat with heels and you have the perfect dress coat for an evening out or add a pair of leather riding boots and you have stylish racing attire. Once you find these basics which form your countryside capsule wardrobe you can start to embellish the look with jewellery, scarves and bags which add a more feminine touch to an otherwise masculine silhouette. I love the jewellery by Daisy Knights, this feather ring is the perfect piece to finish off a country inspired look. Look out for tomorrow's post where I shall present the best outfits for a country summer wedding/garden party.